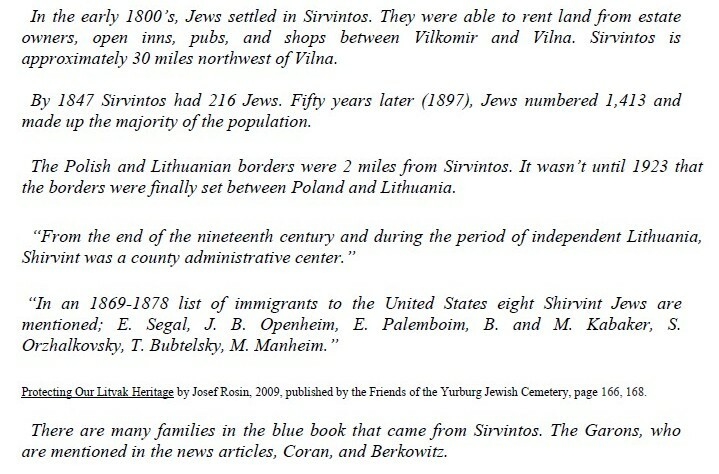 Lithuania history of a small town called Sirvintos (Shirvint). Click here for more information in the original pdf document created by Karen. "Sirvintos (Shirvint in Yiddish) lies in eastern Lithuania, on the shores of the Sirvinta Stream, about 28 km. (17 miles) southeast of Ukmerge (Vilkomir), the district administrative center." "Jews probably settled in Shirvint at the beginning of the eighteenth century. Some rented land from the estate owner, Pesitsky, while others opened inns and pubs along the road between Vilkomir and Vilna, and the town grew and developed. Later, when Pesitsky evicted his Jewish tenants, their main livelihood came from keeping inns, pubs and shops. In 1847 there were 216 Jews in the town. Fifty years later, the government census revealed that 1,864 residents resided in Shirvint, 1,413 (76%) of them being Jews." For the full Shirvint section including text and pictures in pdf format, click here. Nanci and Allan Garon's website.